Images surround us, where ever we go. Most of us don't pay attention to how many images we will come across in a day however, I bet it's more than any of us care to count! We see these, and can instantly process that information in that image. When making Quizzes and Exams with an image Quiz Maker, Quizzes are not only easier for some to comprehend but they are also more engaging. When driving and you see a billboard or a sign on the side of the road that has an image on it without even thinking about it, you glance at it. Images immediately get our attention. And, as quick as you took that glance, you were able to read what it had to say. More than likely, you will still remember that image later. How much text would be required to explain what that same image portrays? If that same billboard had 3 paragraphs of text, you probably would just bypass it. The reason being, you can't take it in that quickly while driving and the majority of us are not about to stop a car in the middle of traffic to read it all. So instead, you just keep on going. Images are everywhere and they grab our attention, whether we like it or not! A Quiz with pictures is a very effective way to aid in the learning process, because a lot of people are visual learners. Images can be understood more easily and they can be read more quickly. With ClassMarker, you can create Quizzes in a variety of ways using images. Create image Quiz questions with answers by adding images to only the question and leave the answers as text. Or, add text in the question and have all answers display as images or a mix of both. You can even make an all image based Quiz, with all of your questions and answers as images only. You have the option to set your image Quiz up any way that you see fit. With ClassMarker's image Quiz maker, you can upload images which means you do not need to worry about finding a place to host your data. You can also link to externally hosted files however as we know sometimes depending on where files get hosted, your images may not always display. When you upload your images with ClassMarker, you will have the peace of mind that your pictures will always be there, stored on a secure and stable Quiz platform. 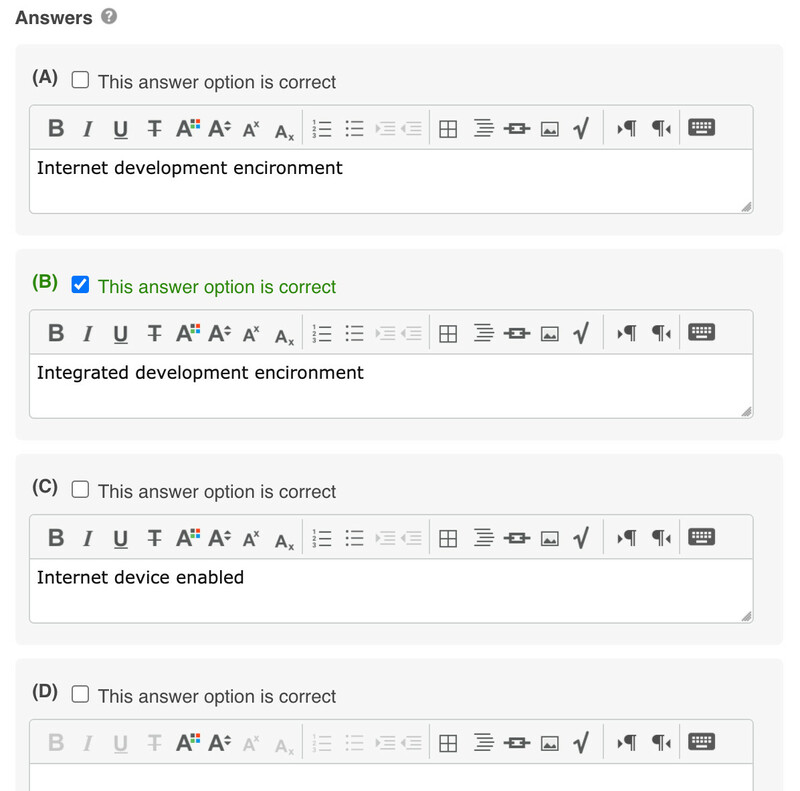 You can add images into the question, answers, Test introduction area, custom instructions (if using Links), custom feedback that is displayed during and after the Test - anywhere you see the 'keyboard' icon. When you click on the 'keyboard' icon, this will expand options in the WYSIWYG editor. One of these options being an 'Image' icon. This enables you to add your images, audio, video and documents. Note: You can add images for answers as well using the 'Image' icon on the WYSIWYG editor. Files: Hover your mouse over Dashboard and click on 'Files'. You can upload files into the Files section, as well as view, replace and remove files. If you need to update an image, you can replace the file. Once the file is replaced, this will update the existing image with the new image, wherever the file is located across all your questions. Images Quizzes are great to use for 'Spot the Difference', Label association, Word Association, Memory Skills, for those who have learning disabilities and more! Try out ClassMarker today, to create your own image Quiz. You'll then be a step closer to asking your users "Have you taken your ClassMarker yet?" How Do I Create a Matching Quiz with Images? How Do I Add an Image to Certification?